Well I hope you all had a great weekend. We had beautiful weather so spent a fair bit of time outside. Jordyn was in Athabasca at soccer training all day on Sunday so Eathan and I went for our first bike ride. This was the first one where both of us rode our bikes. At the end of last year we took his training wheels off and he was getting quite good but had a hard time starting off. This year everything just clicked. It was lots of fun! 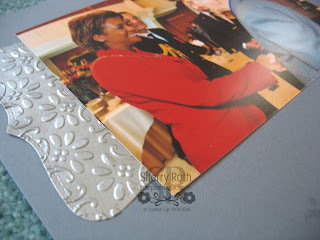 The layout that I'm sharing with you today is the one I did for my scrapbook club last week. I'm really happy with the way it turned out. 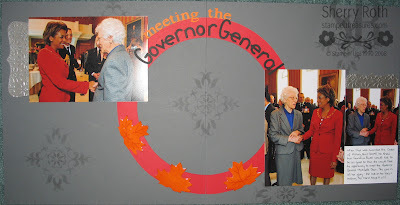 The photos are of my Grandma meeting the Governor General when my Dad received his Order of Military Merit medal in January of 2009. She was in all her glory! The stencil that I used is one that will be available on May 1st called Mostly Vintage. It has a kind of regal look to it so I thought it would work well on these pages. Using the leaves as accents was inspired by the 'necklace' the Governor General is wearing. 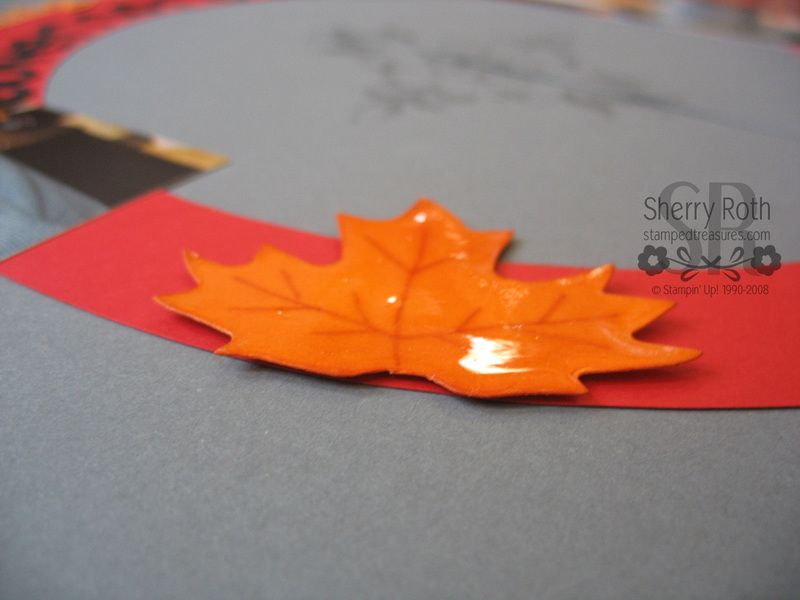 It has orange maple leaves and crowns on it. So I used my Leaves #2 die and cut out a few maple leaves from Pumpkin Pie cardstock. Then I used a marker to add some veines and covered them with a thick layer of Crystal Effects. I love the look of them. This top note piece was created using a technique called the tin ceiling faux metal technique that I saw on Diana Gibbs' blog. Hey honey, am I gonna see you at Convention?